Hello! I know I came across this forum with many problems that seemed unresolved. More exactly, Luna bites me to the blood, eating only a mixture of seeds and cereals and it seems impossible to change anything. Now, I just want to say that Luna has become a very loving gray. 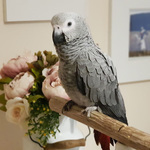 Life with Luna has evolved very nicely, she does not bite, she is very sweet and playful bird, she eat healthy Harison's pellets and vegetables every day and I can take her out with a parrot backpack. She does not talk yet, but I love her, even if she never talks. It's great what happened to us and I wanted to share this with you. I want to tell for the new owners of Africans gray, they not to lose hope and patience as long as there is enough love for their little birds. P.S. Please excuse me, for grammatical and speech mistakes. We always say time and patience is the key. How wonderful to hear, so happy for both of you. Just a reminder though, just like us they have a bad day every now and then don't hold it against her- once she loves you the relationship is there. Can't wait to hear more stories from you and Luna. Congrats on gaining his trust and forming a bond. Thank you very much! Anatole France said that: "Only when we love an animal, we will feel love with all our heart" It's so real! 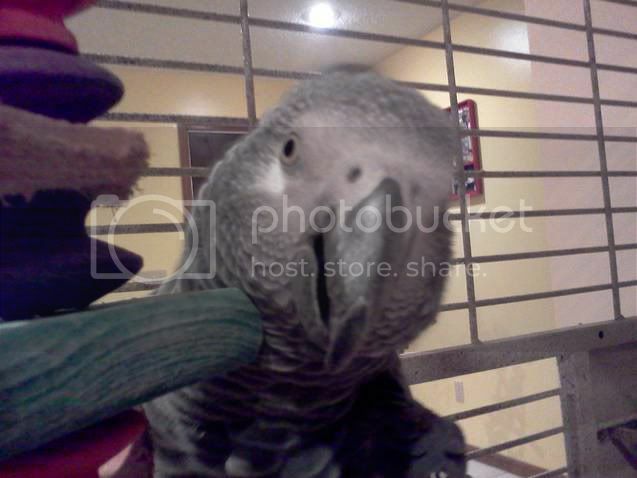 It is wonderful when your love is returned by your feathered baby.